Understanding how to read a food label, determining appropriate portion sizes, making healthy food choices, calorie consumption vs. burning, fats, carbohydrates, protein, micro and macro nutrients, calorie dense vs. nutritionally dense foods, water and staying hydrated, hidden calories and so much more. The above challenges are just SOME being faced by people of all ages today – and it’s getting WORSE with each passing day. With these topics I have just scratched the surface of what it means to survive in our toxic world – and ultimately thrive. These and many other issues have contributed to our society’s obesity crisis and as a result, the onset of multiple chronic diseases as a consequence of our inattention to the basic nutritional requirements for healthy living. It is appalling to me that in only the span of half of my life (33 years), we are seeing the manifestation of this inattention to healthy eating taking many forms such as the onset of type II diabetes in children starting at under the age of 13! This trend – if not corrected or addressed NOW – WILL destroy scores of families if we don’t find solutions for these BASIC pressing issues now. This article is designed for all of us – me as a review – and for those of you who don’t know – an opportunity to “catch up” and maybe make different choices in not only your own lives – but those you love as well! 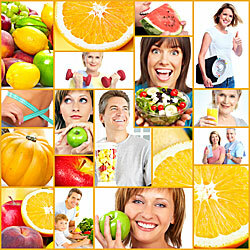 We associate healthy eating with weight loss and diet programs – everything else is eating for fun. We take care of our emotional and spiritual wounds through food. Families gather to eat at Thanksgiving but in the interim we “eat out”, rarely seeing that special time with family again as our days spiral on one to another. Our lifestyle has become toxic through overeating, unhealthy choices, and massive quantities – all in the desire to “forget” or calm ourselves from the stresses of the day. We are immersed in technology and tied to an unforgiving master who demands more from us than many of us can afford to give. The idea of reading a label, or noticing calorie counts before we eat something seems impossible – so we go for the easy “fix” and just say “I’ll get back to making an effort tomorrow”. It is always going to be tomorrow until tomorrow finally doesn’t come. 1. People are woefully unprepared to deal with the enormous impact of marketing and media and the power they hold over our lives. 2. The complexity of foods and their confusing claims about their value is taking our ability to choose rationally away from us. 3. The food industry has basically “kidnapped” healthy eating by making it easy to select every possible harmful form of nutrition (packaged, processed foods, fast food, massive portions and so much more). The basics of healthy eating have become such a “mystery” to most Americans so that every talk show imaginable schedules healthy eating segments and how to lose weight for good regularly! When I was a boy on Maui I ate peanut butter and jelly sandwiches and bananas and we NEVER went out to eat. All our meals were at home with the family sharing in the effort. Calories count and there is no difference between them – they just “are”. Burning calories is what we do to stay alive so eating pretty much is a given. Learning about portion control and balanced intake of nutrient dense/calorie deficient foods is not rocket science. It requires a desire to improve your choices by providing our bodies with the fuel they need to survive and thrive – nothing more, nothing less. We need to get back to “eating to live, NOT living to eat”. The calories now proclaimed on menus throughout America should be a wake-up call to Americans of all ages. Should our food be fried or baked? Should it have sauce or no sauce? Should we eat everything we are served or save some for later? 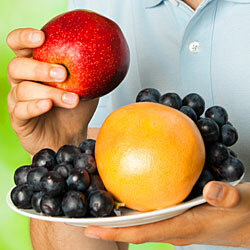 What is the source of the primary calories – saturated fat or carbohydrate? Are we getting enough protein in our diet and is it from healthy sources? These and other questions need to be addressed and I will do my part to help answer them. I am not allowed by my professional code of conduct to provide specific advice on what and how much someone should consume – that is for a licensed professional to determine, but I am allowed to talk about nutrition and the role it plays in leading a healthy and happy life. That is part of my job and I take it very seriously! 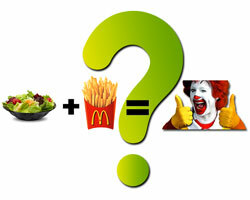 Today I saw a lady at McDonald’s who was eating their terrific side salad but had also ordered the large order of fries – a common staple at McDonalds (what was she thinking – that the one would “cancel” out the other? Or was she NOT thinking but going for the joy the fries bought? I don’t know but it happens all the time!). People don’t go to this place for the salads – they go for the fries! McDonald’s is REALLY good at selling those fries and one cannot blame them for wanting to make a profit after all, can they? The idea that one could order a meal that includes the burger and fries and NOT notice it contains over 1200 calories is “mind blowing” to me. I would have to run 8 miles to burn those off at just under 55 minutes of hard running! We need to “connect the dots” as I do every day when I choose and IF I choose the pizza I am absolutely sure I can run that pizza off tomorrow. Every choice has consequences and every day we will live with those consequences until our bodies say “NO MORE”. That day of reckoning is not far off and if today’s children don’t get to live longer than their parents then we will all be to blame to some degree, won’t we? Does it have water as a primary part of its makeup? Is it fried, boiled or baked? Will it promote my general health and preserve my immune system? Will I enjoy it and possibly eat it again? Can I find a way to eat more or less of this food? 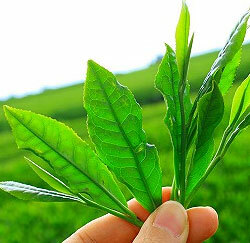 If it has lots of chemicals associated with its manufacture will that eventually harm me? Am I being proactive in my food choices and not reactive to the inevitable emotional swings in my mood that occur throughout my day? Do I eat for reasons other than because I am hungry? Am I compulsive when it comes to eating alone and do I overeat for reasons beyond my knowledge and control? These and other questions are a part of the dialogue on healthy eating and MUST be addressed if we are to slow the death spiral being brought on by the obesity crisis – and its cousin the “sitting of America”. I see the massive need for ongoing education and communication at ALL levels of society and from all aspects of life that touch the American family. 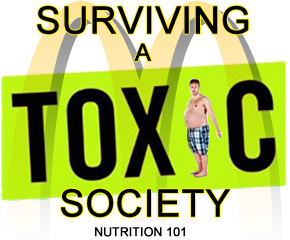 These include the schools, government, the weight loss community, the food manufacturer’s, the restaurant community (including McDonald’s of course who IS actually “trying” to make healthy choices available to its customers although not fully succeeding because of those “damn” fries), supermarkets, the community at large, non profits, spiritual centers and so many more. It will take “that village” referred to earlier to solve the problems we are facing but they MUST be addressed if we are to save lives in the future. I will discuss basic food issues in future articles and identify some of the ways in which we can all participate as part of the solution. If we each just help one person improve something in their nutritional lives TODAY we end up helping “the many” too – and I think that is well worth the effort! Don’t you? Why Are People Getting Fat? Website: HealthyHappyFit.com Email: [email protected] Nick is an author, teacher, and speaker and has been a certified personal trainer and lifestyle and weight management consultant since 1992. He is currently recognized as a master trainer by the IDEA International Health and Fitness Association. He has been a runner since 1964 and has accumulated over 60,000 miles in that time.